"...)\Might and Magic VI\Scripts\Global\Editor Navigate.lua:61: number expected, got nil"
"Might and Magic VI\Scripts\Global\Editor GUI.lua:219: attempt to call field 'SetWorkMode' (a nil value)"
error. I'm really dying to get this because in one of the script files I found that there's something in Castle Darkmoor that gives you +20 skill points but without the level editor I don't think I can find out which point in the map that's referring to! Whooops. Just kidding! Updated to GrayFace 2.1 and it fixed things! THANK YOU! Oh no. There doesn't seem to be a way of figuring out which facet causes which event to trigger. What I'm looking at is Castle Darkmoor (Might and Magic 6, CD2.lua) there's an event evt.map that seems to grant +20 skill points to 1 party member and displays "How Clever! +20 Skill points". I can't find what causes this (or indeed if it has been actually included in the game). I tried exporting the whole map to obj to look at vertices independently but I can't figure out. Any help? Thank you! Download https://www.dropbox.com/s/qmdk7zraqbmyp ... r.lua?dl=1, place it into Scripts\Global and use FindEvent(64) function in the console while editing the map. Thank you so much - it outputs "nil" so apparently this never actually made it into the game. Oh well. (Sorry for spamming) This is all so fascinating, going through all the maps and scripts. For example, in Castle Alamos (probably the most complicated dungeon in the history of CRPG'S) if you answer with the code after getting all the clues from the trees it just says "Ok!" but if you put in the code without having gone through all the trees, it says "Who told you! Alright, you may pass!" I guess I haven't touched all the trees since the first time I played the game in 1998 so I never remember it actually ever saying "ok", I just always thought the second one is what it always said. GrayFace wrote: Download https://www.dropbox.com/s/qmdk7zraqbmyp ... r.lua?dl=1, place it into Scripts\Global and use FindEvent(64) function in the console while editing the map. Hmm. It appears as if it doesn't find an event that isn't directly attached to a facet? In New Sorpigal (OUTE3) I know this buoy that triggers fireballs and rock blasts that's Event 220. The script returns nil for FindEvent(220), but when I go to the buoy to edit it, it shows Event 220 as its event. That fixed it, thanks. But it turns out that Darkmoor event isn't a real thing. You're the best, dude, we owe so much to you. Ok, I copied HardcodedTopicFunctions.lua from the newest update of MM678 Merge and now ExitCurrentScreen() is closing spell book. Exception EAccessViolation in module MM8patch.dll at 069AF012. Access violation at address 069B0012. Read of address 000000A5. Last edited by J. M. Sower on Dec 24 2018, 17:28, edited 2 times in total. Does it still happen if you disable MMExt (by renaming ExeMods folder)? GrayFace wrote: Does it still happen if you disable MMExt (by renaming ExeMods folder)? No, as you can see below. Maybe I will try to disable some scripts and maybe I will found wich is responsible. Last edited by J. M. Sower on Dec 29 2018, 11:14, edited 1 time in total. I found that problem in CharacterOutfits. I have older verion than from the newest Merge mod. Last edited by J. M. Sower on Dec 29 2018, 11:35, edited 2 times in total. How do I use the MMExtension2.2? I really want to delve into scripting but I don't know where to start. I mean what do I have to download and where do I put it? Do I just unpack it inside MM6 installation folder? Some of you may find the question silly but I am new to this and my search on the internet for the info I ask failed to reveal the basics. Last edited by ^Dagon^ on Jan 8 2019, 17:34, edited 1 time in total. Though I love your most recent MM8 patch update, I've been trying to reverse the "fix" that removed the hostility exploit in the Dragon Caves. The placement of the 3 artifacts combined with the respawn complicates things if you want to not lose an artifact down in there before you have a chance to grab it -- or ever if you side with the dragons. In any case, I adapted the sample code on your website to set hostility of archers in MM6 and dropped it into a .lua file in Globals. I tested, and there was no change in my game. Below is my code. Any idea why it's not working? I suspect it's because I may need to use ChangeMonsterAlly for MM8. I don't know what you mean by (id+2):div(3) in your reference doc though. Just install patch and unpack mmextension files into game folder. So I had the very same error and it is fixed now! DropBox seems to be modifying the files when it is packaging it, screwing them up, as we have found out with Rodril! So Rodril uploaded his own zip package, and that works just fine! 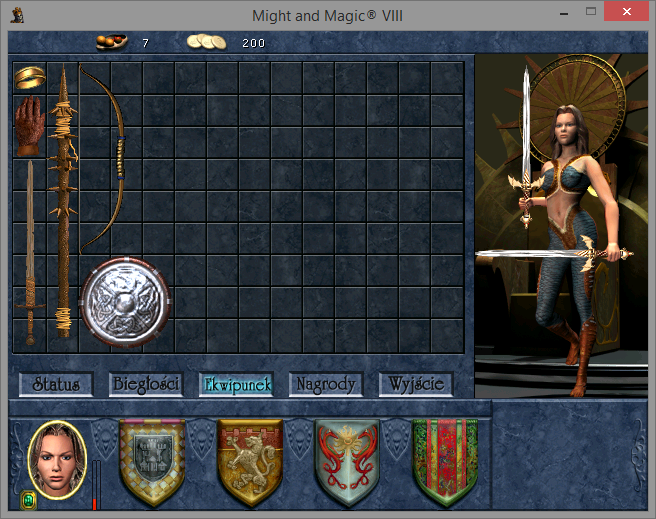 I just installed MM8 from GOG and then extracted the zip file into it, and it works! Last edited by Templayer on Mar 4 2019, 10:28, edited 1 time in total. Trying to modify a MM6 map but the game always crashes when loading a compiled map. Even if all I did was open the map in the editor and immediately compiled it without changing anything it still crashes. Any help? Update: It's working fine in 7 and 8 so this seems like a MM6 specific issue. Last edited by Anerag on Mar 6 2019, 6:23, edited 1 time in total. First and foremost, thank you very, very much GrayFace! I'm forever grateful for the countless hours you've poured into improving these amazing games. This summons a peasant at the location of the party. The thing is, I would like to know how (if possible) can I make the summoned 'monster' to stand passively around, just like the Castle Harmondale guards for example. As the default behavior is that the summoned 'monster' moves around. Last edited by MrHarmondale1184 on Mar 5 2019, 15:21, edited 1 time in total.